Samsung netbook with a 10.1" screen and 1.66 GHz Intel Atom N450 processor. Ok so the my hard drive broke a while a go and i just got round to fixing it, the screen was working before hand as i was using unbuntu from a memory stick on the machine without this problem. anyway to test if it's just the screen or if its an actual wire?? or any advice? all's welcome! Soul post an image of your LCD so we can see what you see. Right now I am tempted to agree with Dan, it sounds like a broken LCD. Ok sorry it took so long, i managed to get some pictures, when i left it running the screen didnt change either. Soul, thank you for your picture. it is definitely your LCD. You will have to replace it. 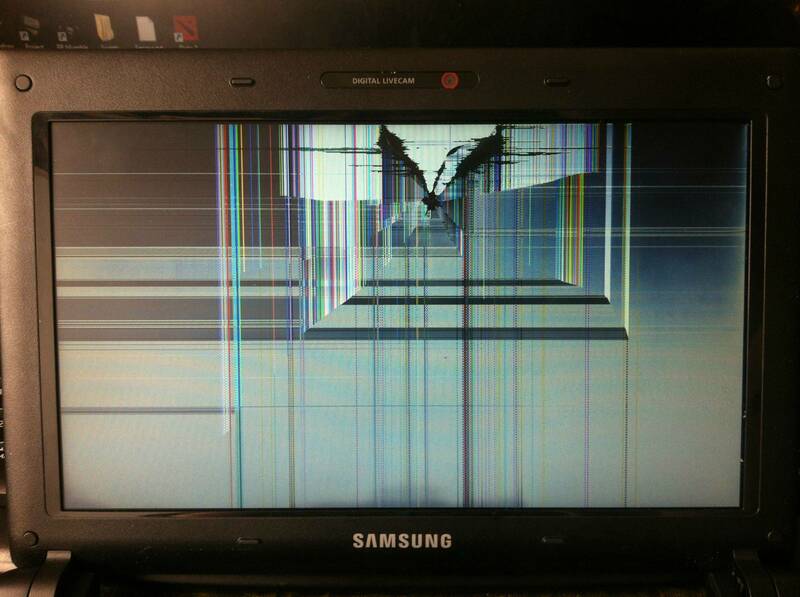 you can get a replacement screen from places like this. For a disassembly video of your Samsung check on here. Hope this helps, good luck. Agreed, it's clearly broken from too much pressure applied to the area where it's black. Good luck on the repair man! Thank you for accepting my answer. Best of luck to you. If the screen was completely white, or completely black, or only had some arrangement of lines through it, I would suspect a damaged flex cable through the hinge. Since you mentioned "a blodge of black", I'm assuming you mean there is no real geometry to this figure. Broken LCD's normally will still light up but will have black areas near the point where it was broken (from excessive pressure, etc.) and the vertical/horizontal lines tie in with that as well. It sounds to me like you are in the market for a new LCD my friend. It is unlikely that it is a motherboard or connection issue. I hope this helps, cheers! I'm new to commmunity but I have a long background in cellular repair, and a lot of education in electronics engineering technology. I came on this site because I got stumped on something, and wound up finding others' questions which I knew the answers too. Post your pic man, I'd be more than happy to have a look and give you my opinion. Yea i feared as much, someone tried to open it up before me and had worn out this one screw, took me a week of trying to get it out but as you guys can see the end ressult wasn't to good.